Vigel Spindle Repair also know as Franz Kessler is well known for manufacturing high end motorized and non-motorized spindles. At HST we have become well know for repairing and rebuilding Franz Kessler spindles. Started in 1923 to provide specialized motors for the textile industry, Franz Kessler has morphed into a manufacturer of high end machine tool spindles. At HST we repair Franz Kessler spindles to the highest standards in the industry. This was “crashed” very hard. 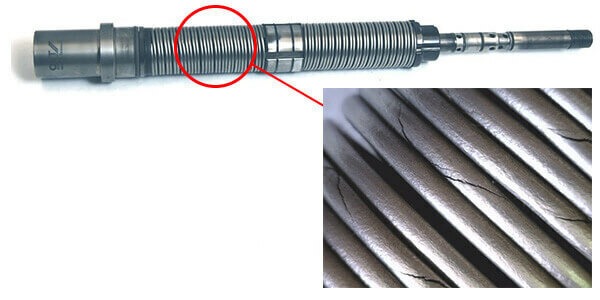 You will notice several cracks in the end of the shaft, which was destroyed beyond repair. It was removed from a Vigel CNC machine. The lead time on a new shaft from the OEM was several months. 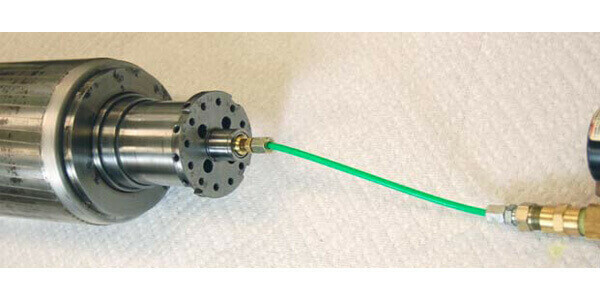 HST manufactured a new shaft and had the spindle up and running in a few weeks. This is an HSK style. HSK style tool interface requires expert precision grinding on multiple surfaces to assure proper tool holder capture. 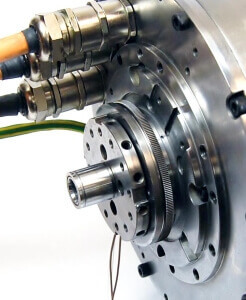 At High Speed Technologies we repair both motorized and non-motorized Franz Kessler spindles. You will find these spindles in a wide variety of high end CNC machines. This is ready to be assembled. It goes on a Vigel horizontal CNC milling machine. We will only use top name brand Super Precision Spindle bearings purchased from authorized distributors such as the NSK brand shown in the photo. This was taken out of a Deckel Maho CNC machine. The spindle kept tripping the drive. 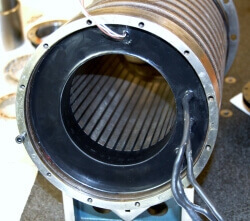 Our evaluation indicated a damaged stator. The stator was re-wound, re-potted and the spindle was completely rebuilt. 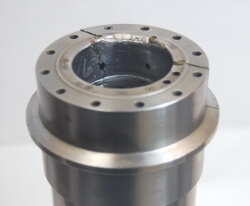 Vigel spindle with damaged stator. This OEM quality rewind and E-PAK took less than 2 weeks to complete.That’s about 1/8th the time from the OEM and less than ½ the price. Faster and less expensive. That’s a real win-win. But what about performance? Performance was fabulous! At 12,000 RPM vibration readings were at the work end of 0.03044 in/sec overall. The run out measured at 295 mm on our standard test bar was less than 2 microns! 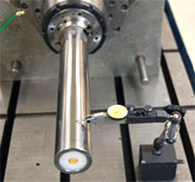 Other components that are critically important to proper spindle performance include drawbar assemblies. This Franz Kessler spindle uses OTT drawbars. Although at first blush this drawbar appears good, our forensic examination shows that the spring is riddled with fatigue cracks and needs replacement. This would never get past our FEQA system. HST can recondition this drawbar to Factory new. We don’t wear red capes. But sometimes we do feel like heroes. 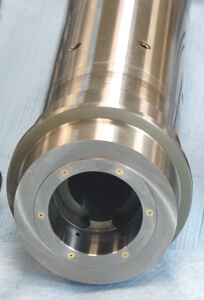 This Franz Kessler spindle came off of a production critical machine. A C-clip sheared out of special balancing flange that secured the rotating union. 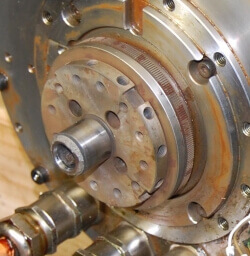 With the rotary union unsecured coolant leaked out over the top of the spindle and penetrated the bearings. The result, PRODUCTION CRITICAL MACHINE DOWN! The part from the OEM was months out. Re-manufacturing this complex part, heat treating and grinding was weeks out. HST to the rescue! A hardened sleeve was manufactured and heat shrunk on. Along with a complete spindle rebuild and the machine was back in service in days. This is just one of many examples of how we make your problems our problem and we don’t rest until we have your solution. It is a very satisfying feeling helping to get one our customers out of a jam. If you have a Franz Kessler spindle that needs repair call HST. We repair Franz Kessler spindles to like new condition. off of a Deckel Maho machine performs like new.